Area control is located in the control center and controls traffic with the aid of radar displays. While tower, approach and departure controls are associated purely geographically with a particular airport, where they control traffic on the ground and up to a certain altitude, the air traffic controllers in the area control handle the rest of Danish airspace - that is, the airspace between airports and above the areas where the air traffic controllers in tower, approach and departure control each have their separate responsibilities. When departure control has handed over an aircraft to the area control, the air traffic controller is responsible for bringing the aircraft up to the desired flight level and establishing the aircraft on the desired route. The air traffic controller gives the pilot the most direct route and ensures that the aircraft arrives to its destination as fast, safely and efficiently as possible. The air traffic controller in the area control also controls all “Transit” flights, that is, flights that fly through Danish airspace without either taking off or landing. For example, this could be a flight from Stockholm to London. The air traffic controllers ensure the required separation between all aircraft that are in transit or on their way into or out of an airport in Denmark. The area controller is responsible for initiating the descent of aircraft bound for landing in a Danish airport and at the same time ensure the required separation to other aircraft. When the aircraft approaches its destination airport, the area controller instructs the pilot to change radio frequency and contact the approach control for the airport in question. 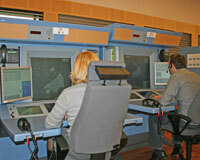 In Denmark the Area Control Center is located at Copenhagen Airport (Kastrup).